"They inspired me to love Browning"
The abundant richness of the wreath in the Asolo Window evokes the feel of an autumn harvest and is a visual feast, with figs (whole and cut) and fig leaves, grapes, walnuts, pomegranates in varying stages of ripeness, the blue berries of Virginia creeper, and other foliage. The central image is the view from the loggia at LaMura, the summer home of Browning's close friend Katharine de Kay Bronson. During his last visit to Asolo, the poet insisted on never missing the sunsets from the sheltered balcony, and he envisioned building a tower just across the steep ravine. Pippa's Tower, pictured here, was built instead by his son, to honor his father's memory. 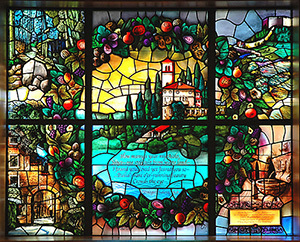 The window is set in late summer or early fall, the time of Browning's arrival in Asolo for his final visit in 1889. The rural road or walking path in the vignette in the upper left corner represents the many carriage rides and lengthy walks Browning enjoyed during his visits to Asolo. The poet had a deep appreciation for the unusual beauty of the area calling it "the most beautiful spot I ever was privileged to see." In the lower left is pictured Asolo's south gate, the Porta Loreggia. A glimpse of the home of Katharine de Kay Bronson, where Browning spent many happy hours, is seen on the left. It was called La Mura, meaning "the wall," because it was set into the old wall of the city. In the upper right corner is an image of La Rocca ("the fortress"), the ruins of a pre-Roman stronghold that crowns the hill above the town, with vineyards spilling down the base of the slope. Browning enjoyed taking the steep climb to the summit, where the view on a clear day included Venice's Campanile and the domes of Padua. The Fontanina Zen or Zen Fountain, dating from 1571, is shown in the lower right corner of the window. It is located just outside La Mura. On his final visit to Asolo, Browning lodged nearby on the street now called Via Roberto Browning.